In the event of a failure, corrective action should be taken immediately. Check and determine the cause of the failure. Maintenance plan can prevent failures by running profilaktichesEvents. A systematic approach should be taken to identify and troubleshoot problems, as multiple recurring failures may cause a problem that has not occurred before. 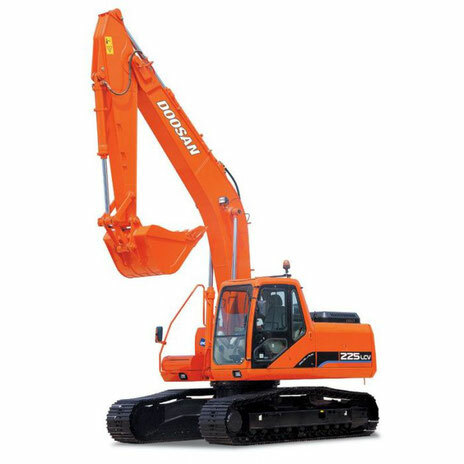 If you cannot determine the cause of the failure, contact your DOOSAN distributor. Do not adjust or dismantle hydraulic components, electrical and electronic components without consulting the distributor of DOOSAN company. Fuel Thickened Of-For Cold Weather. Water Or Dirt в Fuel System. Clear System и Add New Fuel. Engine Starts, It's working Only On Small Speed Or Disables. Clogged Or Dirty Fuel Injectors. Cable Management Speed Engine Not Adjusted. Engine Knocks, It's working Uneven Or Pushes. Clear System и Replace Filter. Contact к Dealer Company Doosan. Strap Fan Weakened Or Damaged. Tighten Or Replace When Need. Add Hydraulic Oil On As Need. Line Suction Beaten Or Damaged. Clear Or Replace When Need. Pressure Unloading Main Flow Oil Too Little. Bleed Air Of Hydraulic Pumps. Power Small Or Missing Only For One Or Two Functions. Pressure Safety Valve Overload Too Little. Repair Or Replace When Need. Tighten Strap Fan When Need. Too Great Or Too Small Tension Truck. Damaged Rollers Or Blanks Rollers. Strap Generator Weakened Or Damaged. Poorly Pinned Or Corroded Conclusions. Failure Disk Regulation Revolutions Engine. Replace Disk Regulation Revolutions Engine. Selector Mode Power Not It's working. Failure Switch Select Mode Power. Selector Mode Work Not Acts.